Mount Gilead graduate Jason Bolha (front row, left) will play golf for Mount Vernon Nazarene University this fall. Sitting with him is MVNU coach Mike King. In the back row are Bolha’s parents, Bernie and Sabrina. Despite not having started playing golf in high school until partway through his sophomore year, Mount Gilead graduate Jason Bolha was able to accomplish enough to get the attention of college programs. He will be the second member of his family to attend MVNU in recent years, as his sister, Bryanna, went there for cross country and track after graduating from Mount Gilead in 2015. Bolha is looking to major in some sort of business field or perhaps education. While competing for the golf team, he feels that he is strong in some aspects of his game, but needs to improve upon others. During his time with the Indians, he was a second-team all-league performer as a junior and a first-team pick his senior year. With that level of success, he has many good memories of those years. 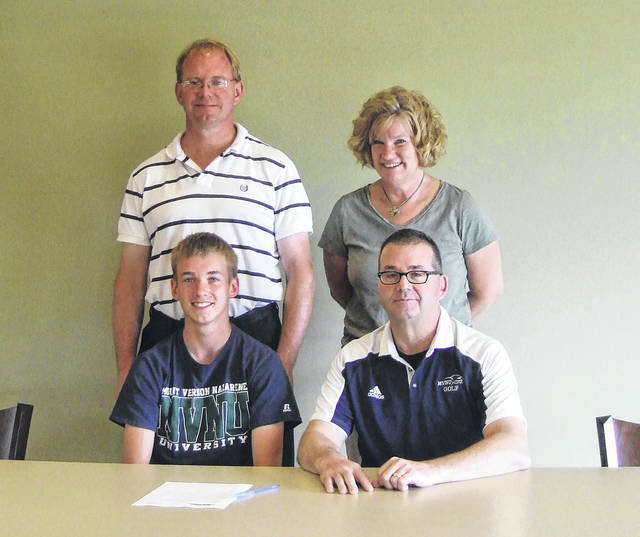 Now, he’s looking forward to making more memories with MVNU.